Here you will find some useful resources for supporting learning at home. This year we are lucky to be a part of the West Berkshire Phonics Network. This dedicated web page has information, resources and details of events we will be running throughout the year to help support early reading and writing development. Reading at home is crucial to reading success. This doesn't always mean sitting down to hear your child read. Reading to your child is just as important, early reading experiences are proven to have a lasting impression and determine future reading habits. We teach reading using phonics as the prime approach. Our children love to know the terminology (mostly because they love long words!) but we appreciate that this is not the way most parents were taught at school. Click on the button below to access our phonics glossary for parents. For those of us who were not taught phonics at school, this useful video clip showing the correct 'pure' pronounciation of phonemes (units of sound) may be useful viewing. Teach your monster to read is a multi-award winning, free online game that can be played online or downloaded to a tablet as an app. As a game it progressively builds through varying levels that are matched to the Letters and Sounds programme of phonics. The funny and engaging games will keep children entertained for hours whilst also continuing to develop reading skills. Pupil reading books are differentiated by colour bands. 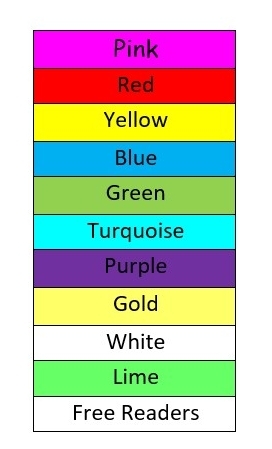 When children have shown they can decode successfully and can answer comprehension questions about what they have read at their current colour band then the class teacher will move them onto the next colour. You can see how the colours progress here.